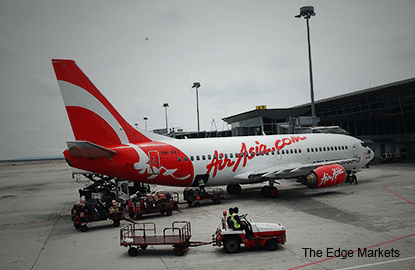 KUALA LUMPUR (July 12): AirAsia Bhd has clarified that a dual listing is not an option the budget airline is formally considering at the moment. "In any event, such an exercise could not be undertaken without the proposal being deliberated by the board or without prior consideration of the various regulatory and commercial aspects on the matter. None of which has been undertaken thus far," AirAsia said in a bourse filing today. It also highlighted that the company is not pursuing any new joint venture in China. "Currently AirAsia is not pursuing any new joint venture proposals as we continue to focus on launching AirAsia Japan as well as strengthening our existing joint venture airline operations within Asean and India," it said. It was reported earlier that the low-cost carrier is eyeing a Hong Kong listing as it expands in North Asia. The news seems to have shored up the buying interest in AirAsia, which saw its share price surge eight sen or 3.04% to close at RM2.71 today. AirAsia was the fourth most actively traded counter on the bourse, with 37.36 million shares changing hands. AirAsia's sister company AirAsia X Bhd was also among the top five most active counters today, with 31.89 million share traded. AirAsia X closed unchanged at 39 sen.